NEW ORLEANS – As I sink into a crescent of red vinyl at Lenny's Piccadilly Lounge, I can almost see the ghost of Frank Sinatra in the dim haze. Years gone by, the Chairman of the Board would stop by after his Blue Room gig at the Fairmont Hotel across the street. Or so I've heard. Frank may be gone, but he lives on in the jukebox nestled among the cocktail tables at Lenny's, which will play "Fly Me to the Moon," "New York, New York" and "My Way." Other immortals available for coins include Sarah Vaughan, Ella Fitzgerald, Billie Holliday, Duke Ellington and Benny Goodman. A dollar goes a long way in New Orleans if you're after comfort food for the ears, and a bill with Abraham Lincoln on it usually buys 18 tunes. Given the spread, you can hear nearly any music style at nearly any hour. Lenny's has a 1940s film noir aura, and the bartender wouldn't dream of sporting a plastic badge with "Hi! My Name Is ..."
The Half Shell Restaurant and Lenny's Piccadilly Lounge, 111- 113 University Place (just off Canal Street); 504-525-4083. Fast forward a few decades and about a dozen blocks to Royal Street in New Orleans' Faubourg Marigny, a funky neighborhood with psychedelic appeal. The Velvet Underground is waiting in the jukebox at the Royal Street Inn & R Bar, which everyone calls "The R Bar." The furnishings take kitsch to strange heights. An effigy of stewardess Betsy Boone (that's the name on her little brass tag) dangles from the ceiling – at least the upper half of her, replete with one of those drop-down oxygen masks with the stretchy elastic bands and yellow plastic cup. Bar stools are covered in faux leopard, and a drum set is suspended upside down over the bar. Back to the jukebox. Where else can you hear "Wayne Newton's Greatest Hits" ("Hello Dolly" included) or "Carve That Possum" by Southern Culture on the Skids? Then there's some Miles Davis, Bjork, Wilco and Leonard Cohen in thrown into the mix. "No dogs after sunset," reads the placard on the door, which lets you know that the bar is open from 3 p.m. to 5 a.m. every day except Saturday and Sunday, when things wrap up at 6. If you can't make it back to your hotel, there's always the inn upstairs at this self-described "Bed & Beverage." The R Bar is also a congregating point for the Krewe of St. Ann on Mardi Gras, a raucous, meandering herd, most of it locals decked out as wizards, plus courtiers and nearly naked people. 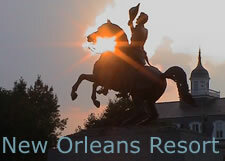 Royal Street Inn and R Bar, 1431 Royal St.; 1-800-449-5535. Operating on the more-is-better principle, Le Bon Temps Roulé on Magazine Street, has two jukeboxes, along with two rooms, two bars, and two pool tables. The place locals call "The Bon Temps" (rhymes with Won Ton) is like a college town roadhouse. High-octane food and music combinations are possible: Philly cheese steak washed down with The Doors; an alligator sausage po-boy served with a cut from Chitlin' Eatin' Music by J. Monque'D. Le Bon Temps Roulé, 4801 Magazine St.; 504-895-8117. Ironically, there are bargain rates (five songs for a dollar) at a place where one is least likely to indulge: Mid City Lanes "Rock 'n' Bowl ." Part bar, part dance hall, part bowling alley, Rock 'n' Bowl is retro all over. Some locals live for Thursday nights at "Rock 'n' Bowl" and the chance to dance to prime southwestern Louisiana Zydeco. The campy salmon-and-cream decor has been there since the 1950s. Preview the joint at the club's nod to modernity: Rocken Bowl. The club spreads out at the top of a steep staircase in a somewhat gritty strip mall where Carrollton Avenue meets U.S. Highway 61. Stand still and someone will grab you for an impromptu lesson in the syncopated Zydeco step, which only looks simple. The floor heaves seismically to the beat of dancing couples. If you get there at an off-hour, you might be able to hear the jukebox, which houses The Dixie Cups' version of "Iko Iko" and Ernie K. Doe's "Mother-in-Law." Mid City Lanes Rock 'n' Bowl, 4133 S. Carrollton Ave.; 504-482-3133. Suburbanites need their respite, hence, the Rivershack Tavern, self-proclaimed "Home of the Tacky Ashtray." There's nothing but the levee and the Mississippi across from the tavern's home at 3449 River Road in Jefferson Parish, a short way from the city line. Bring in a tacky ashtray, and score a free drink – the tackier the ashtray, the better the drink, the barmaid says. Despite the regular-guy air, you'll find The Village People on the jukebox. An Elvis painted on velvet hangs on one wall, and the gap-toothed mug of Alfred E. Newman decorates another. Tunes are retro heaven. There's Tom Jones and Don Ho, along with ABBA, James Brown, Garth Brooks and Tony Bennett. Go figure, as the natives say. Rivershack Tavern, 3449 River Road, Jefferson, La. ; 504-834-4938. Lisa Stansky is a freelance writer in New Orleans.